5/31 Cup of Coffee: It was a solid night down on the farm as the affiliates almost had a clean sweep. 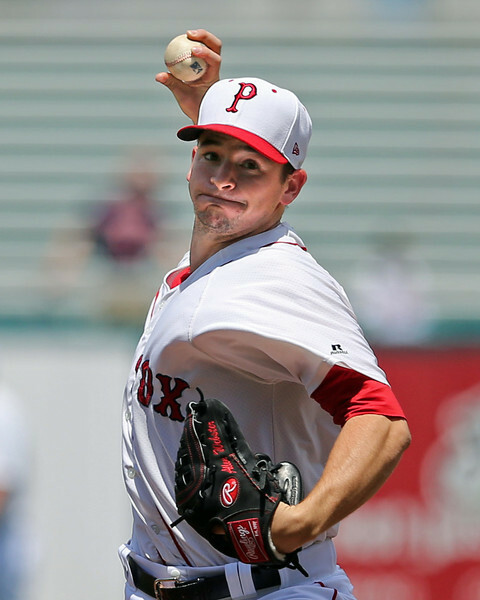 Pawtucket got a great pitching performance by Allen Webster (pictured). Portland's bullpen helped them get the win. Salem lost in extra innings while Greenville slugged out a victory. Pawtucket cruised past the Norfolk Tides (BAL), 7-2. Allen Webster had his strongest pitching performance of the season, going eight innings to earn the win and lower his ERA to 2.94. Webster allowed three hits and one walk while striking out seven. His lone blemish was a solo home run in the seventh. Tommy Layne came on in the ninth. He walked one and gave up a run. Pawtucket got on the board early on a Corey Brown two-run homer in the top half of the first inning. Brown led the way offensively going 2 for 4 with a double and three runs batted in to go along with his home run. Justin Henry opened things up in the eight inning. With two on and nobody out and Christian Vazquez already home on a throwing error, Henry delivered a two-run single that scored Mike McCoy and Shannon Wilkerson. Newly promoted Travis Shaw went 2 for 4 with a run batted in and Christian Vazquez and Shannon Wilkerson both had two hits apiece. Pawtucket was 2 for 11 with runners in scoring position on the night and left 11 runners stranded on base. Portland opened up it's series against the Trenton Thunder (NYY) with a 4-3 win. Brian Johnson was on the mound and went six innings giving up five hits and three runs (two earned) while walking three and striking out seven. Michael Olmstead pitched two innings in relief and earned the win to move to 2-0. Robby Scott came on in the ninth to earn his first save of the season. Stefan Welch led the offensive attack for Portland going 3 for 4 with two doubles a single and a run batted in. With the game tied at three in the eight inning with one on and one out Blake Swihart and Sean Coyle each singled to load the bases for Bo Greenwell. Greenwell would walk to force in the winning run. Salem fell to the Potomac Nationals (WAS), 5-4 in extra innings. William Cuevas got the start for Salem. The right-hander went five innings and gave up four runs on three hits and struck out five. Nate Reed came on for two innings of hitless relief and Kyle Martin took the loss, giving up the winning run on a sacrifice fly in the 10th inning. This was their fourth loss in their last five games, moving them to just one game above the .500 mark. Salem was led by Reed Gragnani and Jonathan Roof. They each went 2 for 4 on the night with an RBI. Trailing 4-1 in the sixth, Roof hit an RBI triple and was then brought home on a double by Gragnani to pull the Red Sox to within one. Ryan Dent tied things up with a double to left field scoring Gragnani. The rally ended when Aneury Tavarez lined into an inning-ending double play. The Greenville Drive pulled out the victory over the Hickory Crawdads (TEX), 7-6. The Drive had a 1-0 lead going into the fifth inning when Jamie Callahan lost control. Callahan walked three batters in the inning along with a hit batsman and a wild pitch. Callahan threw 79 pitches, 44 of which were strikes. In 4 2/3 he gave up five runs (three earned) with four hits, four walks and three strikeouts. The bullpen was strong in relief, led by Raynel Valette who went 3 1/3 scoreless innings to get the win and move to 4-0 on the season. Mike Adams came on in the ninth to earn his third save of the year. The Drive scored five runs in their own half of the fifth inning. They opened the frame with three straight hits. One of them, a two-run double off the bat of Jordan Weems scored both Manuel Margot and Kendrick Perkins. Jantzen Witte finished with a 2-for-3 night with two RBI, two runs scored and increased his team leading average to .356. Player of the Day: Allen Webster had his best performance so far this year on Friday night. The right-hander threw his longest outing of the season going for eight shutout innings and seven strikeouts. Webster is third in the International League in innings pitched with 67 2/3 innings.